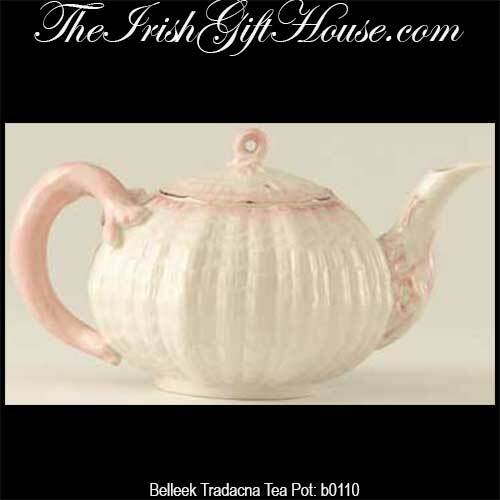 The Belleek Tradacna Teapot features shades of pink on fine china. The Belleek teapot was re-introduced in 2008 for one year only. The Belleek Tradacna teapot is part of the 2008 archival collection and is limited to 600 pieces; the teapot was originally produced in 1872. The Belleek teapot stands 7 1/2" tall and is made of fine china that features hues of pink. The Belleek China teapot is safe to use in the dishwasher and microwave oven.